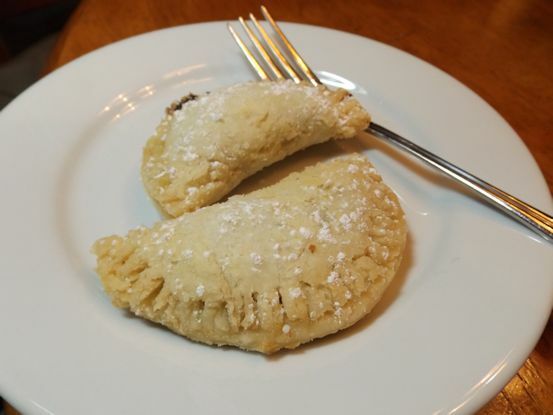 Chocolate Fried Pies – Save Up Some Calories! I have been gone for quite a few evenings lately and eating out, so I was excited tonight to have a chance to cook a full meal from scratch. I decided to make our favorite pasta and then tried a new recipe for dessert. 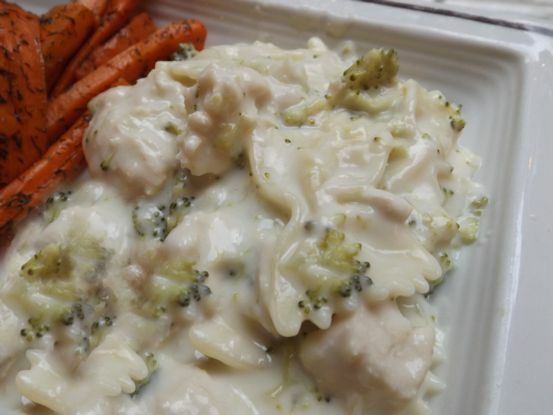 First, we had a creamy garlic pasta sauce with broccoli and chicken. I can give you an approximate recipe but it is very forgiving and you can dump away and it will still taste good. I guarantee it. Boil pasta in salted water until tender. Bake chicken at 350 degrees 45 minutes or until tender and juices run clear. Steam the broccoli and set aside. In a skillet, soften the garlic in the butter. Stir in the flour and cook until smooth. Add the chicken broth and cook until incorporated. (At this point I used an immersion blender to make it smoother.) Stir in the cream cheese and Parmesan cheese. Stir in the milk. Add the chicken and broccoli. Adjust taste with salt. You can add more milk if you like a thinner sauce or leave thick. Serves 4. Now, for the good part. 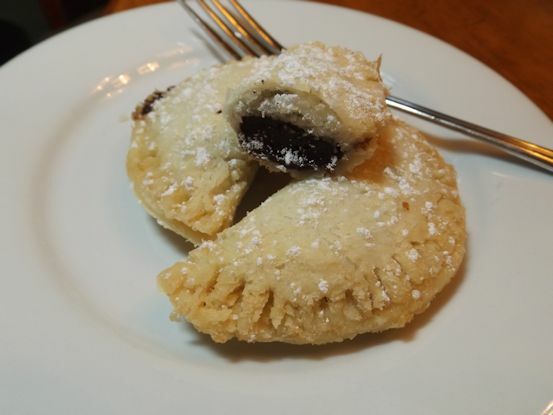 The fried chocolate pies. I have never attempted fried pies before so when I saw the recipe, I knew it was time to expand my repertoire. This recipe came from a Southern Living diner cookbook. It is from a restaurant called Cabana in Tennessee. I accomplished this recipe with only one slight burn on my arm from the hot oil. Needless to say, be careful! Prepare the filling. Whisk together first 4 ingredients in a 3-quart saucepan. Gradually whisk in the milk. Cook, whisking constantly, over medium heat 9 minutes. or until very thick. Reduce heat to low; stir in butter and vanilla. Remove from heat, cover, and let cool to room temperature. Pour oil to depth of 1 inch in a dutch oven; heat to 360 degrees. 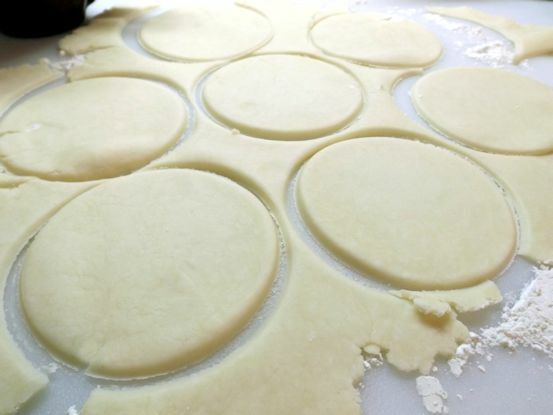 Meanwhile roll out each ball of dough to 1/8-inch thickness; cut into 3 6-inch circles (I changed this and cut into 3 1/2 inch circles with a coffee mug as my cutter.) Spoon one tablespoon of filling in the center of each 3 1/2-inch circle. (Use 1/3 cup with a 6-inch circle.) Brush edges of circles with egg; fold dough over filling, and crimp edges with a fork to seal. 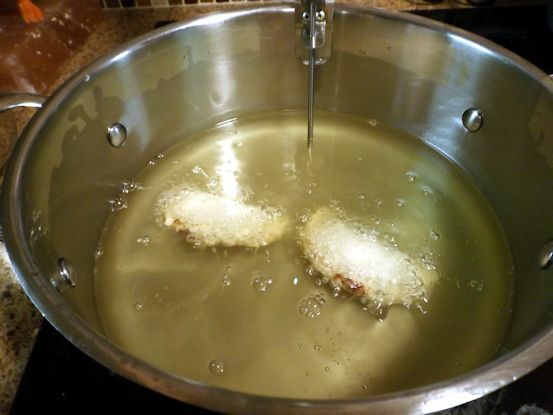 Fry pies, 2 at a time, in hot oil 3 minutes or until golden. Do not turn. Drain pies on a paper towel on a rack. Let cool. Dust with powdered sugar just before serving. Makes 6 large pies or 12 small ones. Here’s a quick view of the process. You must try it! So delicious! 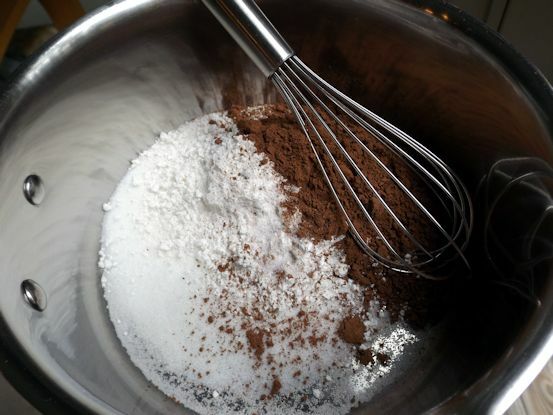 Mix together the dry ingredients for the filling. Next add the milk and cook for NINE MINUTES stirring continuously! Nine minutes is a long time. Some people can run almost two miles in 9 minutes. Turn on some music, jog in place, but don’t go anywhere and don’t stop stirring. 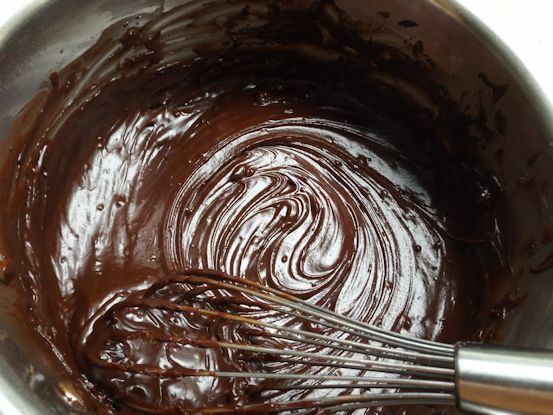 You will end up with a yummy, thick, chocolatey filling. 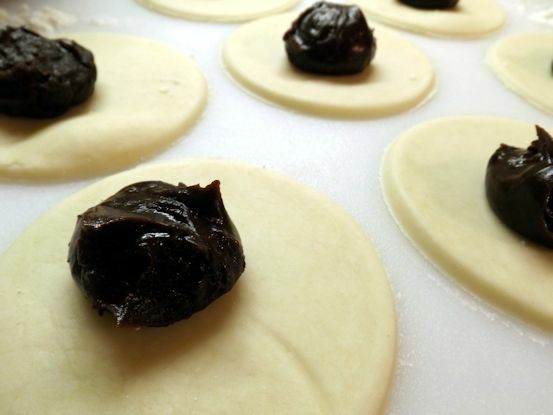 Roll out the dough and cut into circles. I used a mug rather than a cutter. Dollop on the filling. Sealing these pies before frying was probably the hardest part but I finally got the hang of it. Fry at 360 degrees. Watch the temperature carefully. Take lots of pictures before you eat the samples. There are no second chances.